At Amada Boston MetroWest, Laura Lynn and Jim Morrissey have made it their mission to seek out individuals who have that higher calling for providing care that allows their clients to age gracefully. By forming strong bonds with our clients, we are able to understand their unique needs and preferences and personalize the care we give them. We are determined to enrich clients’ lives by going beyond tasks like cooking and light housekeeping to make every day special in the ways that mean most to them. This might include taking an interest in their favorite programs, creating more opportunities to spend time with the people they love, or something as simple as learning exactly how they take their coffee. It is our insistence on providing comprehensive and compassionate care that has led to Amada’s excellent reputation for senior care near Boston, Newton, Wellesley, Needham, Natick, Dedham, Canton, Sharon, Framingham, Chestnut Hill, and other nearby communities. At Amada Senior Care Boston MetroWest, our services are not limited to in-home care: we see families through every aspect of senior care. This means we can help clients identify the best assisted living environment for their needs, help them make sense of long-term care insurance policies and other methods of financing, and provide any other solutions to make sure our clients are safe, comfortable, and content. To learn more about how a compassionate member of our team can assist you or your loved one with activities of daily living like those listed here, please contact us for a Free Care Needs Consultation. At Amada Senior Care Boston MetroWest, we take the time to understand each client’s unique needs and preferences so that we can create a customized care plan that is ideal for them and helps their loved ones feel confident that they are receiving the highest quality of care. Our LTCi experts at Amada Senior Care make sure policyholders fully understand their benefits. With the support of Amada’s long-term care insurance team, our clients are able to submit forms in a timely manner so they can receive their benefits more quickly. Through our years of experience, each member of the Amada team has developed relationships with multiple long-term care insurance carriers as well as third-party administrators. This means that we are able to contact these companies directly and can personally advocate for our clients. Once your Amada LTCi advocate has made sure your claim is filed and reviewed, he or she will continue to support you by coordinating a care plan specifically designed to meet your unique needs and help you take full advantage of your benefits. For the members of our team at Amada Senior Care Boston MetroWest, the services we provide for our clients are more than just a job—they are an expression of our passion for delivering the highest quality of care. It is our intention that everything we do contributes to a safer, happier, and more fulfilling life for your loved one. We have been very happy with Amada's services with our long term care insurance. Help was always there to consult about forms to fill out, and once we began our claim, Amada was able to take care of paying for their services and I didn't have to do this. I have full confidence in their work, and I know I can always call them if I have a question, or a comment. I trust them. AMADA was recommended to me by a close friend who is a nurse in the greater Boston area. AMADA exceeded my expectations. Everyone from the office staff to the aides did what they said they were going to do.The care that my mother received during the last few months of her life exceeded my expectations. They made a difficult time as pleasant as possible. Thank you to the entire AMADA team! Amada Senior Care provided my sister and me with the compassion that we honestly needed to keep our Mother at home until the next level of care was needed. This time at home would have NEVER been possible without their help. Also their caring, thoughtfulness and sincerity even included noticing an over-payment that in these confusing times we would never had picked up on. They have your back at all times and I thank them for that. At Amada Senior Care Boston MetroWest, we realize that not every senior can thrive in a home-care environment and that there will come a time when some of our families need to consider the transition to assisted living. Each member of a family experiences this change in a unique way, and the range of options and emotions our clients and their loved ones face at this time can be overwhelming. We are here to help. Not only does our team have in-depth knowledge and working relationships with the majority of the care communities in the Boston MetroWest area, but we also take the time to understand each clients’ needs so we can guide them to the most appropriate environment. Some families unfamiliar with senior housing may not be aware that there are different levels of care available. For example, a nursing home will provide seniors with extra support and offer more complex medical services, while an assisted living community usually offers a more independent lifestyle but still provides help with activities of daily living when needed. In addition to helping our clients and their families select the right type of senior living environment, it is important that we also guide them to places where more personal needs will be met. We know how to help seniors find the ideal placement to suit their unique personalities, location preferences, social habits, and other personal preferences. At Amada Senior Care, our mission is to provide a range of full-service solutions so that each family we work with can find the right solution for their unique situation. This is why we are so proud to offer our revolutionary home monitoring system, BeClose, which allows families to keep a “virtual eye” on beloved seniors from anywhere and at any time. BeClose allows seniors to live independently while their loved ones remain confident that they are safe. Families choose from a variety of products and devices to create the home monitoring system that meets their specific needs. Popular products include automated door locks and thermostats, medication monitors, security cameras, and fall, intruder, and emergency alerts. All of our BeClose devices are aesthetically low-profile and easy to use, and they all work together to provide families constant updates through a secure mobile app. With BeClose, we can even notify families when changes in a senior’s routine or behavior may reflect a need for a higher level of care. Now, families can always “BeClose” to the ones they love through the latest technology from Amada Senior Care. To learn more about remote care options from Amada, please Contact us today for a Free Consultation. Another way Amada has pioneered the use of technology in senior care is through our Transparent online portal system, widely accepted as the first in the industry. Transparent allows families to get up-to-the-minute updates on caregiver activities and their loved one’s current status through a simple and secure mobile app. 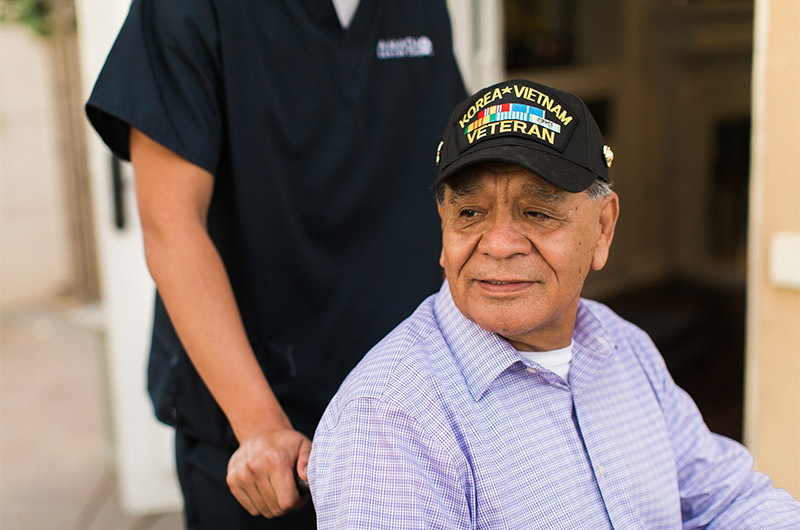 At Amada Senior Care Boston MetroWest, we are honored to care for many veterans who served our country, so we have become experts at helping veterans afford the highest quality of care. One program that some veterans and their families may not know about is the VA Aid and Attendance benefit, which is in place specifically to defray the cost of help with ADLs for veterans. If you think you or your loved one may benefit from this or other programs for veterans, please Contact Amada for a Free Veterans’ Care Consultation. Eligible veterans have served at least one day of active duty during a time of war and a total of 90 days’ active duty overall. Claimants can not have dishonorable discharge. VA Aid and Attendance is for wartime veterans or spouses who require help with activities of daily living from another person. These ADLs may include transportation, walking, bathing, eating, and more. Claimants must currently spend most of their income on care. Benefits are awarded according to the percentage of income claimants spend on care, up to a maximum amount. The VA will determine an acceptable maximum limit for applicants’ assets. Age and financial need are considered when this limit is determined. Paid monthly in addition to pensions. Paid directly to claimants by the US Treasury.